Namely, it is needless to talk about the healing properties of this fruit, and especially about its effect on the cardiovascular system. But, do you know how that cherry pits have a very powerful healing effect? We're used to throwing them, and it's really a shame to do that. In fact, with a little effort, you can make a healing pillows to relieve joint pain. They are proven to help in the fight with nervousness, headaches and stress. Stay with us and find out all the ways you can use pitted cherries for your health. Cherry pits need to be washed well arrange on a tray and dry for several days in the air. Avoid their direct exposure to sunlight. Then pour them in linen, cotton or silk bag and form a pillow, if desired. Semi-circular pad of cherry bag is ideal for keeping around the neck, a square one for other parts of the body. Fill the bag with 300 to 400 g of dry seeds (this is approximately six to eight kilograms of fresh cherries). This is designed pillow can serve you for years and at the same time not lose their therapeutic qualities. Why are bags so efficient? The fibers that form the core are excellent for retaining heat and cold, so these bags can be replaced with a hot water bottle, and a bag with ice. If removing pits from does not represent a problem for you be sure to use them like this. Heated cushion of cherry pits reduces muscle tension, stomach cramps, pain and neck stiffness, frostbite. On the other hand, when cool it helps in case of sprains, bruises, toothache, headache, migraine. It is best to make a pillow case with buttons or Velcro material, since the bag with pits does not need to be washed. What is the usage of medicinal bags? Bag with cherry pits relieves headache in the short term. Depending on the cause – it helps to warm, cool the affected place. It is best to keep it for ten minutes on the forehead, crown and temples. Given the fact that the seeds of cherry are round in shape, pad provides a massage effect. It improves circulation and helps to relax the muscles of the head, shoulders and neck. Tension and overload, physical and emotional, is a very common problem in humans. Bag with pitted cherries can help you to relax if you use it in heated form. Put it on the shoulder, on the neck, and hold for 10 to 15 minutes. For even better effect, take a comfortable position that suits you best. You can sit, lie or stand, if you feel more relaxed - and very soon you will feel relief. 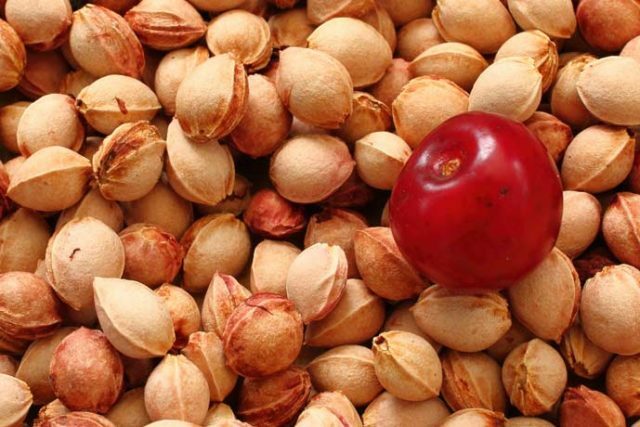 Cherry pits will help women who are struggling every month with PMS-symptoms. Warm pillows proved effective and simple solution. Heated pad apply for 10 to 15 minutes in the lower abdomen and lower back. Unpleasant pain in the said region will loosen, moreover you will not even feel discomfort. Pillows can be put on your breasts that are sensitive before menstruation. Warmed bag with pitted cherries improves mood and helps you fall asleep easier each night. Relax in your favorite chair for 15 minutes. Warm bag massage down the back, to the buttocks, keeping it for a minute or two on each area. Then you can put it on the knees, and finally down to the joints of legs and feet. At night on the pillow, put cool or warm bag of cherry pits. Sprains, bruises and swollen areas are best treated with cold compresses. Put the cherry pit bag in the freezer for two hours, but not directly, wrap it in a plastic bag. While chilled put it on the painful site as long as it feels good. 10-15 minutes three to five times a day, keep it on a painful wrist until inflammation reduces. In the period of worsening of state bags with cherry pits is used on the lower part of the stomach for a period of fifteen minutes. Even in chronic inflammation of the bladder it provides a very quick relief. Many women believe that during menopause cold compresses are a real lifeguards, at least at certain moments. The best advice is to have a cold cherry pit bag ready in the freezer, because it will help due to heat attacks. It will give you relief and lower your body temperature. If you are forced for a long time to sit at a computer or most of the days you spend in the car, listen to this advice. A small pad warmed to room temperature on the lower part of the back, just a little above the waist. Keep it so at least half an hour a day. Soon you will realize how much cherry pits are efficient. You have impaired circulation in the neck, there is a solution! Several times a day lie on your back by placing a bag on the lower part of the neck. Remain in this position for 15-30 minutes. How to use cherry pits in a bag? It is noteworthy that the cherry pits bag is completely safe for all ages. It is used to clean skin if directly placed. Do not apply it after the use of ointments, gels, creams and the like. Lying on the pillow, stabilize the position of the head and neck, improving circulation to the brain and normalizing sleep. It can be used in a sitting position - to improve posture neck, back and rump, with a slight effect of massage. Heated (heated by the radiator or in the oven). It takes eight to ten minutes to be heated at 80 ° C, or in the microwave for 30 seconds to a maximum of two minutes. Before using let it cool a little, but do not worry about that, pitted cherry retain heat for a long time. Warmed pillow relaxes tense muscles and reduces cramps, it is used for massage. Once warmed, it has a pleasant smell, reminiscent of fresh bread. Cold bags with cherry pits have a refreshing and analgesic effect. In the case of the fatigue it helps you to get rid of drowsiness. Also, if you are forced to stay in a stuffy room, it normalizes the functioning of the brain and suppresses the headache caused by high temperatures. It mitigates severe pain (such as pain with sprains), and reduces swelling and relieves bruises. Simply, bags can be used in every situation, same as cold compresses. If you have more cherry trees, maybe you are not even aware of what potential lies in your garden. The powerful small cherry pits burn extremely well, have a strong flame and will give more heat than wood pellets. At the same time, they leave quantitatively less ash. In a word are ideal for boilers. The moment when heating with biomass becomes popular, you will have a valuable energy source. In America, because of its properties it is very appreciated and requested. As you can see cherry pits have multiple benefits to our health and should not be considered a waste. If you are not willing to make cherry pit bag by yourself, you can always buy it on the Internet. Its price in the web shops is 6 dollars. Be sure to first check the manufacturer and read the experiences of people who used them. On this occasion, we will remind of our earlier article about making homemade cherry juice, be sure to read it.